A long-wear lipstick that provides pure color, and a shiny finish that lasts overtime. Superior comfort both in application and on lips. Plumping actives improve hydration and smooth your lips. A long-wear, fluid lipstick that provides highly pigmented color, and a glossy finish that lasts overtime. Superior comfort both in application and on the lips. Plumping actives improve hydration and smooth your lips. Especially loved by women who do not like to feel lipstick on their lips. The light texture of this highly pigmented, covering lipstick gives great definition to your lips, both as a fully covering shade, but also as a mere stain. Apply Milky Lips with the brush applicator first by painting the lips with just a small amount of lipstick, then fully load the applicator to fill inside of the lips. Milky Lips is also great for a more stained effect: just load a tiny bit of the lipstick onto the applicator, apply and blot for a matte stain. A highly pigmented lip-gloss for an ultra-wet, yet long-lasting splash of color that combines transparency and intensity. Non-sticky, so providing superior comfort both in application and on the lips. Plant seed oils improve hydration and protect your lips. A mega-shiny gloss to bring out your lips to the fullest, both as a covering shade, but also as a mere stain. Apply Glazed Lips with the brush applicator first by painting the lips with just a small amount of gloss, then fully load the applicator to fill inside of the lips. Glazed Lips is also great for a more stained effect: just load a tiny bit of the gloss onto the applicator, apply and blot for a stain. 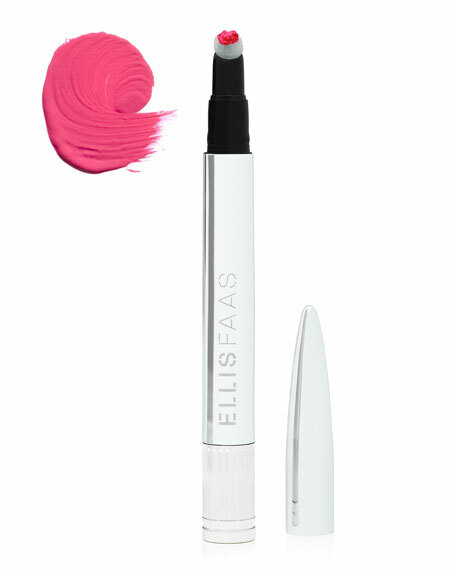 Hot Lips is Ellis' revolutionary texture for the lips. Because it's absolutely packed with pigment, you'll only need a tiny bit of the non-greasy Hot Lips to add vibrant color. Hot Lips are extremely longwearing, without the risk of drying out your lips. A little goes a very long way! A highly pigmented lipstick giving full, longwearing color to your lips. Apply Hot Lips with the sponged applicator first by painting the lips with just a small amount, then fully load the applicator to fill inside of the lips. Full of pigment, so a little goes a long way.